I started this one back in April…and I was so excited and gung ho about it for about a week..and then I felt kind of eh about it…and now I like it again. It’s my cycle of quilt love. This one is from the Strawberry Fields line by Fig Tree Quilts…made with a jelly roll. Now that its done I wish I would have made it a Queen size…but that would have meant buying 2 jelly rolls and I just couldn’t will myself to spend $80 bucks for it at the time. It’s a really soft & pretty color combo..these photos don’t do it justice seeing as how the background was still brown and ugly when I took these photos….and there is bird poop in almost every picture! Your quilt is really pretty. This is really gorgeous. I like the soft colors. The gray/brown back drop makes the quilt look even lovelier. The bird poop…well…never mind. Very pretty! Where did you get the pattern for the quilt? I have a jelly roll that I picked up about 8 month ago, I've been trying to decide what to do with it. The fabrics would look great in this pattern! I love your color choices, every quilt you do is in colors I love! I guess thats because I just love color, no neutral for me! oh my! i love it! i really love that line. I love this. I'm going to have to make a cot one in as close to this as I can. Off to plan it now! A lovely quilt .. I didn't even notice the bird poop! I just love your quilt!! I have this line of fabric in a layer cake, do you think I could use that? I love the pattern you used. Beautiful! Every time you show a new quilt, I think to myself, "THIS is the next one I want to make"! This is no exception. You also bring up a good point that quilting is not cheap. So often people will want me to help them make a quilt for their beds to save money. HA! If that's the case, run to the store and buy the big bedding set and you've saved yourself some money. Only quilters know the great expense that goes into each one, which is always worth it! I didn't even notice the scenery with your very pretty quilt! Now I would have NEVER noticed the bird poop! !haha and I LOVE the dark scenery…it almost appears to be black and white and it just makes your quilt colours pop!! What a gorgeous quilt!! Well done! This is definitely a favorite of mine. I just cut out my Strawberry Fields jelly roll to make it for me. :-) I've had no quilting mojo for months so I'm hoping this might jump start it. Love, love, love it!!! I hear you on buying 2 jelly rolls, but that sure would be cute on a bed! I love this quilt. I was asking if you had a pattern for sell. I opened your patterns link and there it was! I am totally getting this pattern for my next quilt! I love it! Now I might have to buy some of this too! Beautiful!! I really love the Strawberry Fields line and this pattern is perfect!! Oh well, poop happens! I love the quilt so much, you do such a beautiful job. I really enjoying seeing what you are up to, thanks for the great pictures. How pretty!! Love the pattern!!! I didn't even notice the background. All I saw was a beautiful quilt! Another lovely quilt – you have such a great sense of balance in your designs! It's beautiful!!! You are so talented! Do you quilt your own quilts or do you have someone to quilt them for you? Oh, I love it. Strawberry Fields is my new favorite fabric. That is until they make a new one. i just love the colors in strawberry fields! you really picked a perfect quilt to use them in. great work! This quilt is SO cute! I am going to put this on my list of quilts to make someday! You're so talented. I like it very very much. And I like that it's made with only one jelly roll. 'Though here in Germany the prices for jelly rolls are insane… I like the pattern and maybe that's something for the queen sized quilt I like to do someday for our bed. Lovely. Such beautiful fabrics and love the pattern. Thanks for showing it. Think the bleak background actually shows off the contrast of your beautiful quilt really well! Love the quilt! I am currently working on a quilt from your pattern myself. I am making the throw size for a picnic quilt to enjoy! 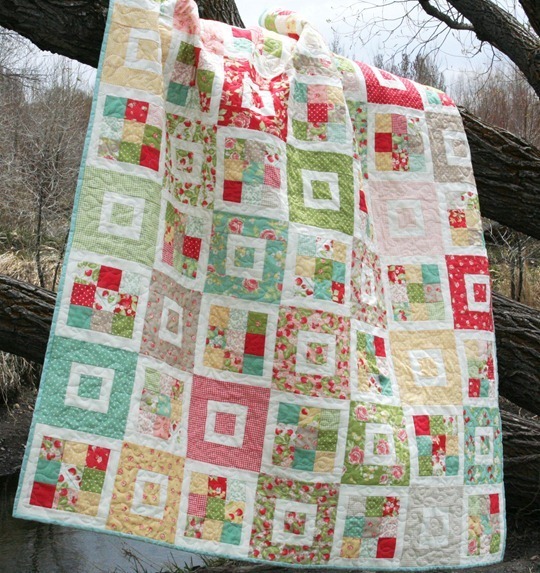 gorgeous – and the quilting is really fabulous – I'll have to purchase the kit when it arrives at the FQS – and of course its the great pattern that makes it ! I like this a lot, now I want to make one too. Dang. 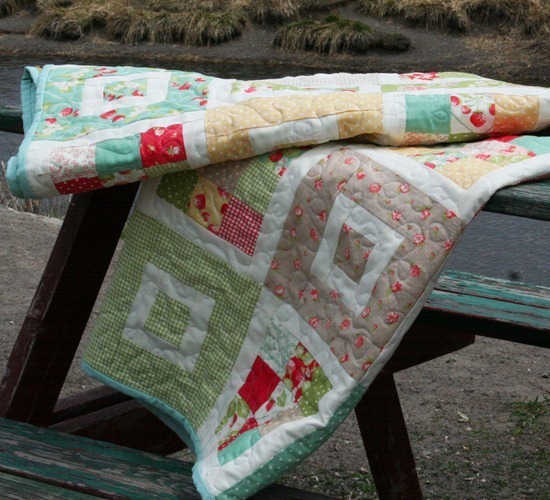 I tweeted about your gorgeous quilts on Twitter – too good to keep secret!!! It is lovely!!! Does it use a layer cake? I'm thinking about making a quilt for a colleague's daughter. Thanks! 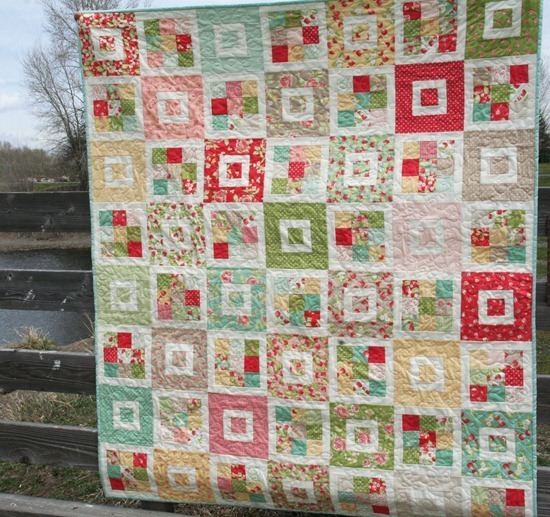 Very pretty quilt….love the fabrics! I just finished making this quilt for my niece who is going off to college next week. I LOVE it but those nine patch blocks were a doozy! I'm a so excited to have it quilted, bind it and send it off to her to keep cozy while away form home. Thank you!